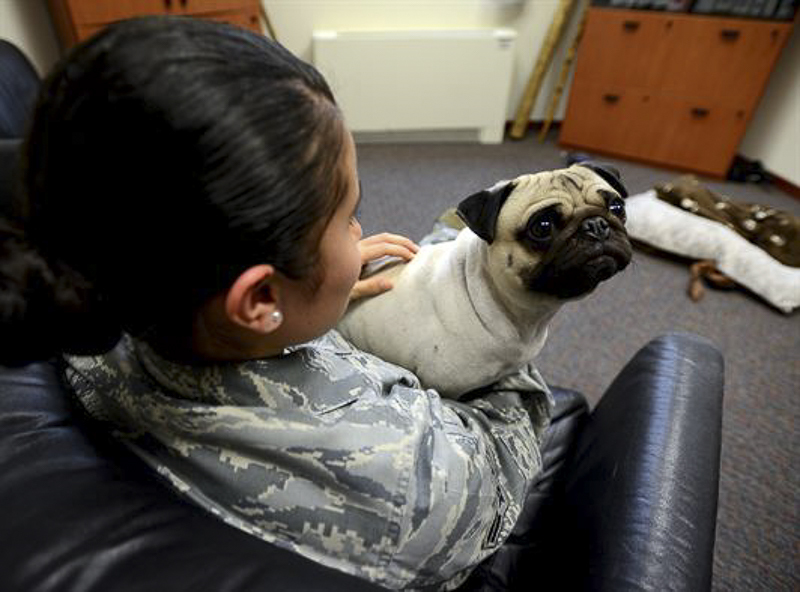 While pugs are not traditionally thought of as service dogs, they do make great therapy ones! While they may not fit the requirements for a Seeing Eye dog, or a guide dog, they are great for emotional support. Pugs are warm, kind-hearted dogs and they usually establish a powerful connection with their owners in time. Still, this is not the only reason why I believe they will be great as therapy dogs. Below I outline 5 reasons why pugs make great therapy dogs. When you learn about how to train a therapy dog, you also learn that you need a dog with the right attitude and one that can comfort, love and emotionally support the person who needs them. A pug can learn how to lift up the owner’s spirits, as long as they have the right temperament. This small to medium dog breed has a great temper and is able to deal with various needs of their owner. 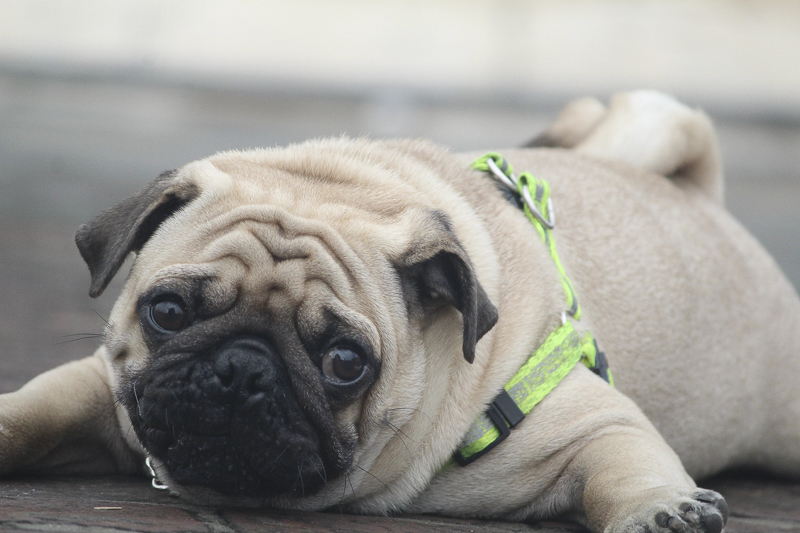 Pugs love to be around humans and socialize, so it will be easy for the owner to feel better and emotionally comforted. Whether the owner has depression or a disability, pugs have the ability to offer a brighter view on the matter. 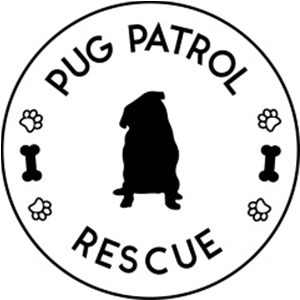 Pugs love to be petted and this is an activity that proved extremely soothing in various disorders. Even more, they are extremely loyal, and want to be around you all of the time. Your pug will make you the center of attention and loves to have attention given back to them. Those with ADD or Alzheimer’s disease must keep their mind focused but this comes more difficult for them. With a pug around, they must focus on giving attention to the dog and staying in the moment. This way, pugs help create a happy atmosphere and help the owner stay positive in their mind frame. Pugs are adaptive dogs, and they can basically live anywhere. They are happy dogs that just want to be with their owner, no matter where the location is. They can live in apartments and smaller homes as well. 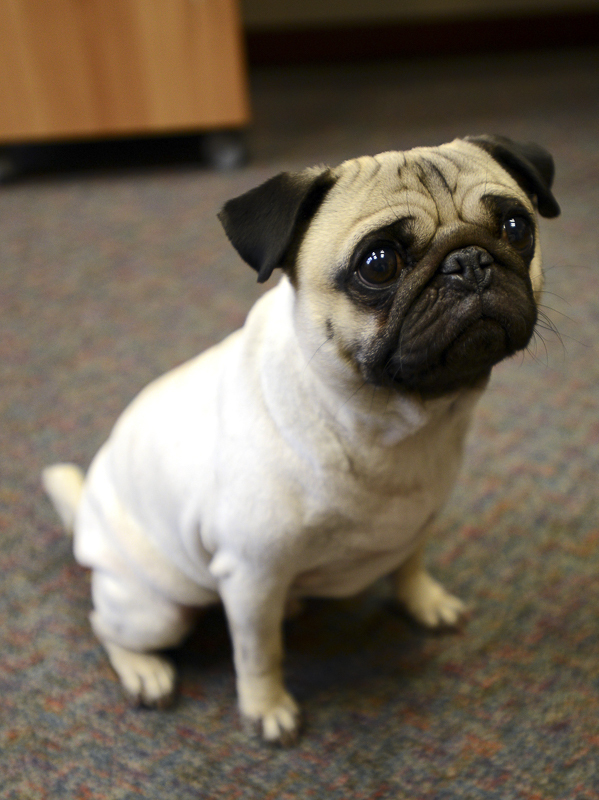 Pugs are also great first time dogs, as they are generally non-aggressive and are known to be extremely friendly. No wonder this is one of the most popular breeds out there! Pugs are known to be a low maintenance breed. Generally quiet, they don’t get too active while indoors, which is great for those who are older but want a companion. 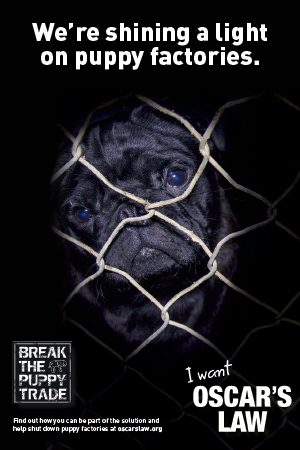 You will still have to walk your pug regularly and make sure it has play time. A pug is known to be pretty calm, and they love to sit in their owner’s lap a lot. Once trained, they generally have good manners but they can also learn basic commands. More importantly they can sit around for a while without constantly licking or pawing at you. If the owner is a little older, or if the dog is visiting a hospital, they must be comfortable in that type of atmosphere without getting frantic or getting loud. Pugs as therapy dogs are great because they are social and are pretty calm around hospital equipment, wheelchairs, tubing, and walkers. As we said, pugs are sociable dogs. Therapy dogs must enjoy contact with other humans and be comfortable with lots of people. If they ever stay in a hospital with their owner, there will be many strange people around and they will react happily whereas other dog breeds may get aggressive or protective. A therapy pug will have to be comfortable with lots of touching, and pugs do love that! From the elderly to children, pugs love to interact, be touched by and be around humans in general. They are very friendly and positive dogs, and their ability to be like by all humans makes them great therapy dogs. A therapy dog must have confidence as well, which pugs have. They will not react the way other dog breeds would when it comes to their owners making noises like sneezing. Pugs are very confident no matter where they are, which is comforting to those who need them. Pugs are very smart dogs and as therapy dogs, are made to sense when you need them. 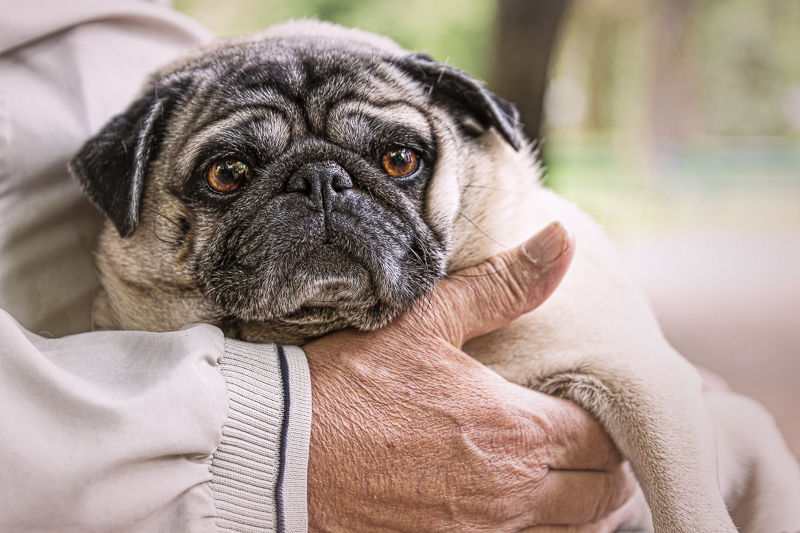 If you are suffering from a disability or having some emotional issues, pugs will come give you attention and love, and will allow you to be comforted by petting them and talking to them. They can also be a silly breed, so there are many laughs to be had if you have a pug as a therapy dog in your home. They are also great at knowing their boundaries and learning what is expected of them within the household and what things will not be allowed within your home. As you can tell, pugs may not always be the first choice as therapy dogs, but they do have the ability to step up to the plate and take on the job. They are smart, loving, social dogs that keep the owner focused, aware, and in good spirits when they need to be uplifted. Pugs are a great choice for those young and old, who need them as a therapy dog. They are great on a leash, and can adhere to the commands that are required of therapy dogs. Pugs are also patient and gentle. Pugs love being touched, loved, and given attention, and will give all of that love back, as well as loyalty to their owner. If you are looking for a therapy dog, consider a pug, as they can easily meet all of the requirements and will brighten your home and melt your heart! Yes. Our little blind pug, a puppymill survivor, and I are in training to become a CHAMP.ion Therapy dog. Not only will she bring joy to seniors, we will visit blind and disabled kids and adults and spread the message that being different is special and wonderful. I’ve only seen pugs become service dogs because their owners have gone through the training with them.